Here at the UMO we teach that there are no accidents or mysteries but that everything exists for a perfectly logical reason. Unlike the scientific notion that the universe and all of creation could be the result of a freak accident we teach that that the universe and everything within it serves a predestined purpose, however, we refuse to be drawn into simplistic notions. Our mission has always been to develop a comprehensive philosophy that explains the universal truths of existence in a clear and precise manner. Every known civilisation seems to have held onto the idea that life continues after death and most have been engaged in what could be termed spiritual practices. The pessimist would suggest that this is because we are afraid to face up to a finite existence and so we invent beliefs (e.g. life after death) in order to fight off our fears. The optimist however, would suggest we are intuitively aware that there is a greater unseen reality that lies beyond our mundane experience. Even now in our scientifically advanced age spiritual practices refuse to end, in fact they appear to be on the increase. What does happen however is that we develop new theories as to what this unseen reality is all about? Unfortunately for us life did not come with an instruction manual, and although we may intuitively recognise there is more to life, working out what it is can be is a bewildering and time consuming task. Thousands of years ago people were faced with the same problem we facetoday, and just like us they were force to speculate. We wanted to know then what we want to know now: "why do we exist?" Just like us they had no instruction manual. When it comes to asking questions on life mankind does have a very serious weakness; we have a tendency to see the world from our own unique but very narrow perspective. What theory would such a self-centred viewpoint produce? One theory that dominates spiritual practices is that of a God creator. Typically, this being is characterised as having similar characteristics to a man. It is projected as the king of the Universe; it is wrathful or vengeful to its enemies but kind and generous to its allies and friends. Was mankind created in the image and likeness of God or did we create a God in the image and likeness of man? This viewpoint lies at the heart of ancient religions such as Christianity, Judaism and Muslimism to name but a few, and these religions account for a large number of the population of the world. Logically speaking, there is no reason for believing such an entity exists; there certainly does not appear as if there is some being watching over the good and castigating the bad, in fact, it seems we are left pretty much to our own devices. Ethical behaviour, it seems, is our problem not God's. Fewer and fewer people are going to church, at least in the western world where freedom of choice is respected and encouraged; and this is probably because this simple notion of God is increasingly being seen as too unsophisticated and irrational to a society whose intelligence is growing exponentially. Yet spirituality refuses to die. We are still looking for this hidden reality despite our previous failings, only we are now seeking a deeper explanation. This is not to say that each and every religion does not have something beneficial to offer its members, it’s more that there unwillingness to move with the times and update their literature to address a more sophisticated public, will eventual result in their extinction. Since the beginning of time, the old has always made way for the new. It is not my intention to show disrespect to the ancient religions or their followers it is more my intent to suggest that mankind has failings. Mankind is growing in intelligence and we require a more sophisticated debate. Spirituality shares a commonality with science in that they both need to develop new approaches and teachings as our understanding grows. The problem for spirituality however is twofold. Firstly, if they admit they got it wrong then they risk loosing the confidence of its members who chose to follow its teaching on the understanding that it was founded on eternal truth. Secondly, the cornerstone of nearly every religion is based upon the assumption that what they teach was the revelation of God, therefore if they subsequently suggest that some of their teachings are incorrect, or even misinterpreted, then they loose their mystical status of being the sole provider of God’s word, and they become just another group of people looking for answers. Ok then you ask, what makes the Universal Mind Theory better than all the rest? Obviously we believe we have discovered something profound, something deeply enriching and bounded by wisdom, but we differ in that we use the power of logic to develop this new philosophy as opposed to ask for your trust. Now there are some that suggest that logic cannot be used to penetrate that deeper reality, some would even suggest that thought can be a hindrance - but we find this viewpoint misleading. It is true that some spiritual experiences are indescribable and beyond rationalisation, after all, can do you describe what a Strawberry tastes like to someone that has never had a Strawberry? However, it is still possible to describe how Strawberries came to be. Mankind is not far away from being the true masters of their destiny; our technological advancement means we are not far away from conquering the forces of the universe. But technology is a product of mind and an expression of just how unlimited we truly are. If anything this just shows that when we put our mind to it we can accomplish anything and that includes unearthing the answers to a few basic, although fundamental, questions. Spirituality must advance in sophistication in order to feed the hunger of a technologically and educationally advanced society. Saying things like “God does not intervene with the problems of man because it respects our freedom but it will punish you after death if you do not behave in a predetermined manner” is illogical and insults our intelligence. There is deeper reality that lies beyond this world and we exist for a specific reason, and unearthing this age old mystery is a worthy way to spend our time. It is an epic journey of self discovery. 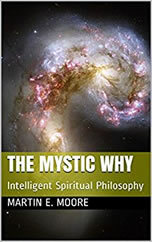 If you are dismayed by current spiritual practices or even if you are looking to expand your mind with new ideas then you have nothing to loose by reading our literature. At the very least you can say you tried something different.